Presented by: Crossroads For Florida Kids, Inc. and Florida’s Children First, Inc. on October 27, 2017. Robin Rosenberg details the legal bases for rights of children in foster care, to assist their lawyers in evaluating legal needs and planning advocacy. 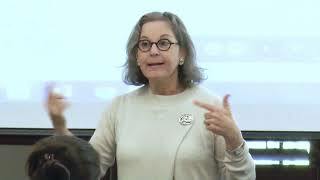 Ms. Rosenberg also discusses practical tips for nurturing natural relationships in the lives of kid clients, and closes the training with a 2017 legislative update. Honorable Katherine G. Essrig speaks about the expectations of the judiciary in dependency cases. Stephen Todd and Selina O’Shannon address the topic of education, and Stacy Appleton presents a primer on social security benefits. 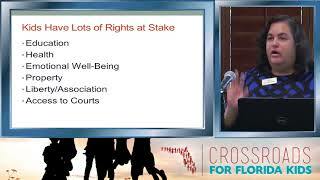 A training notebook is available for Crossroads For Florida Kids pro bono attorneys. 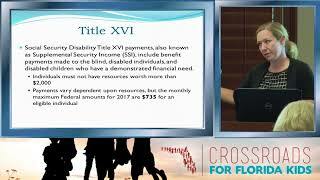 Contact Rosemary Armstrong to obtain one, or to learn more about becoming a Crossroads attorney, at rosemary@crossroadsfloridakids.org.